Cottonwood trees, like people, come in male and female. And, as with people, it takes two to tango. The dance goes like this: The male's flowers contain pollen and each spring the wind whisks that pollen away to fertilize the females. Within a short time, the fertilized females produce pods full of the cottony substance for which the tree is named. Tiny seeds - the hope for cottonwoods' continued existence - nestle in that cotton. When the pods burst open, the wind catches the cotton, creating what may look like an early summer snowstorm. After the cotton lands along stream banks, the seeds take root and seedlings sprout. Cottonwoods excel at broadcasting their next generation. And elk love to eat that new growth. Especially when wolves-their primary predator - are not around. Between 1926 when the last Yellowstone wolf was shot and 1995 when the first wolf was reintroduced, Yellowstone's elk grew lazy and abundant. Their burgeoning numbers browsed wherever they wanted and for as long as they pleased, devouring the next generation of cottonwoods each and every year. In 2003 two scientists from Oregon State University, Bill Ripple and Bob Beschta studied trees along the Lamar River and found many tall cottonwoods more than seventy years old - trees that would have been seedlings around the time Yellowstone's wolves were killed off. They also found thousands of tiny cottonwood seedlings that had grown in the few years since the wolves returned. But they found nothing in between. With wolves absent, fearless and hungry elk stopped the cycle of cottonwood regeneration: seedlings growing into young trees which mature and replace dying old trees. Too few wolves led to too many elk and not enough cottonwoods. 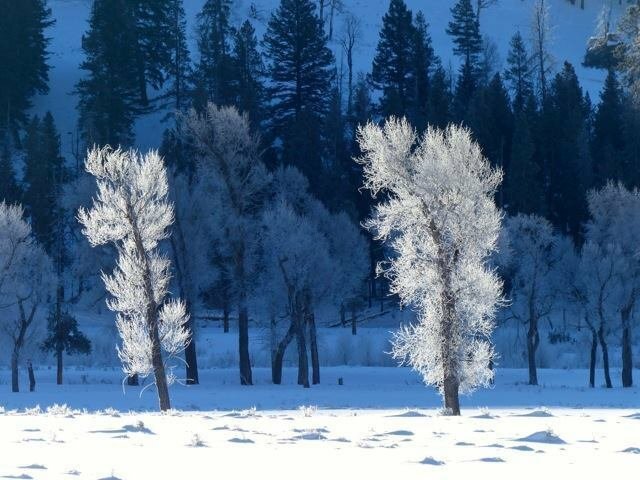 In some parts of Yellowstone, cottonwoods faced the possibility of dying off. Since the return of wolves, the next generation of cottonwoods are surviving - in certain locations - according to another Ripple and Beschta study. They found young cottonwood and willow growing taller each year in sites the scientists labeled as "high risk"- spots where the elk could not see wolves approach or from which the elk had no easy escape route, spots where dining could be deadly. On the other hand, seedlings showed little increase in height at "low-risk" sites - where the elk still felt safe to browse at will. With wolves back in the park, elk were living in what became known as an "ecology of fear" that determined where they browsed. Wolves and cottonwood and elk are inextricably tied in a natural balancing act. Remove wolves and the system falls out of balance, threatening the cottonwoods and elk. This is just one example of how wolves benefit the ecosystems in which they live. Rick Lamplugh is a wolf advocate and author of the bestselling "In the Temple of Wolves." Available as eBook or paperback at http://amzn.to/Jpea9Q. Or as a signed copy from the author at http://bit.ly/1gYghB4.